Julius Caesar, the Colosseum, and the birth of Christianity—all roads lead to Rome. 753 B.C.E. - 410 C.E. Start here to learn about ancient Roman art—from its precious cameos to its marble monuments. c. 400 B.C.E. - 79 C.E. 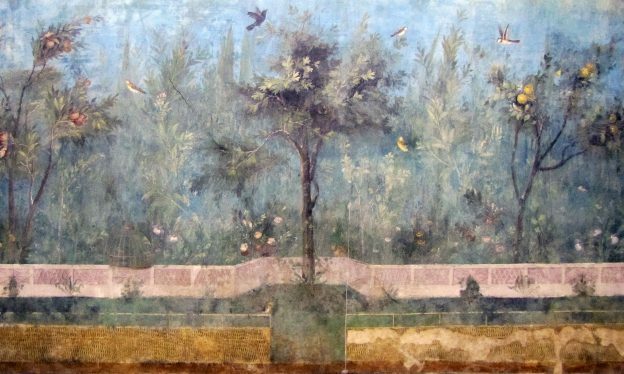 Paintings from antiquity rarely survive, but thanks to the eruption of Mount Vesuvius and the preservation of Pompeii and Herculaneum, we can see what the Romans saw. c. 509 - 27 B.C.E. Between the period of Kings and Emperors, there was the Roman Republic, whose most important political institution was the Senate. 27 B.C.E. - 117 C.E. With Augustus, the Roman Empire begins, and so does a 200-year period of peace and stability known as the Pax Romana. By the time of the emperor Trajan, the Roman empire encompassed the whole of the Mediterranean, Britain, much of northern and central Europe and the Near East. In the third century C.E. the Ancient Roman Empire was threatened by economic crisis, weak and short-lived emperors and usurpers, and the loss of territory to barbarian invasions. Trebonianus Gallus — emperor or athlete? It can be difficult to pinpoint just what is Roman about Roman art, but it is the ability to adapt, to take in and to uniquely combine influences over centuries of practice that made Roman art distinct.